A 2011 study by Association for Pet Obesity Prevention found that over 50% of cats were either obese or overweight. 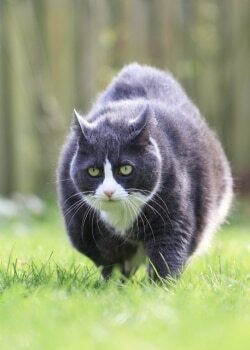 Obesity has been associated with increased risk for serious medical conditions in cats. Studies show that obese cats are five times more likely then cats of normal weight to develop lameness requiring veterinary care. Excess weight puts stress on joints, muscles and ligaments, and can predispose cats to soft tissue injuries and osteoarthritis. Obese cats are four times more likely to develop diabetes mellitus, are two times more likely to suffer non-allergic skin conditions such as dry, flaky skin and chin acne, and are at risk for a potentially life-threatening liver disease called hepatic lipidosis. All of which also have a side effect to your wallet. Pet insurance can help cover medical issues with cats but to alleviate potential financial and emotional stress on yourself, it’s best to help your cat shed the pounds. Find out how pet insurance could offset other medical costs for your cat: Learn how pet insurance works and if you need it. Many factors affect obesity, including reproductive status, gender, age, level of activity, diet type, and feeding style. For instance, neutered or spayed cats require fewer calories for their daily need, and indoor cats that are inactive and fed “free choice” (food available at all times) will tend to overeat. The bottom line is this: we feed them too many calories. Calories not burned off during exercise or used for basic body function will be stored as fat. So how do we get a fat cat to lose weight? Start with a thorough physical examination and consultation with your veterinarian to determine your cat’s current body condition and check for any obesity-related medical conditions by basic testing with blood and urine samples. Next, your veterinarian will evaluate your cat’s current diet and living conditions and will plan a weight loss program for your cat’s specific situation. High-protein, low-carbohydrate diets are my preference for weight loss in cats. Cats are obligate carnivores, meaning that they must have meat in their diet in order to obtain key amino acids and essential fatty acids necessary for normal body function. Canned foods, especially the grain-free variety, generally meet the requirements of a high-protein, low-carbohydrate diet better than dry foods. This is because the manufacturing process for dry diets requires higher carbohydrate content. Cats can use carbohydrates in their diets quite efficiently. However, excess carbohydrates in a cat’s diet are not burned as energy, but are instead converted to triglycerides and stored as fat. Protein is THE key nutrient in a carnivore diet, so canned food is the best option. In addition, cats do better with two to four small, controlled portions daily. Exercise is another important part of the weight loss equation. Outdoor Cats – If your cat is in an environment where he or she is safe getting outside on a regular basis, then it is OK to consider letting them out. This can be a great way to get them moving. Keep these cold weather safety hazards in mind if you are experiencing winter weather. Boring indoor environments can be a contributing factor to obesity in cats. Environmental enrichment can help a cat become more active and expend energy to obtain its food. Try hiding food throughout the house in multiple dishes so your cat has to “hunt” for it. Other items that can be provided to increase activity include climbing towers, window perches, scratching posts and cat toys. Getting an obese cat to lose weight needs to be done gradually…no crash diets allowed! Rapid weight loss or prolonged periods of anorexia can lead to the hepatic lipidosis mentioned earlier. Slow, steady weight loss results in a better chance of your cat maintaining its new lower body weight long term. Be committed to the weight loss program and avoid getting discouraged if things don’t go smoothly from the start. It takes time for cats and owners alike to adjust to lifestyle changes. Successful weight loss means that your cat could live a few extra years and have a much better quality of life. That will make you happy too!